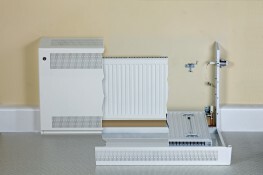 The D SERIES radiator is the first in the world to incorporate an internal Wi-Fi module. It allows the user to control all the features of the product together or individually from a smartphone, tablet or PC with the free Rointe Connect mobile app. With a new curved design, a 1.77' TFT screen, front dissipation wings that favour natural air convection and made from high quality 100% aluminium, these radiators are designed with you in mind. The D Series electric radiator is Lot20 compliant and includes 20 years guarantee on the aluminium body and 3 years on the electrical components. Low consumption technology – Fuzzy Energy Logic Control – This specialised low consumption technology takes energy optimisation to the next level. It improves the energy management required to maintain a stable temperature within a variation of only +/- 0.25oc. The technology will also predict the amount of energy needed to reach the set temperature, maximising cost savings. Energy saving functions – USER mode allows you to set a minimum and maximum temperature for the ECO and COMFORT modes. The Open Windows function will detect a 4ºC temperature drop within a 30 minute time period, and then automatically move into ANTI-FROST mode at 7-8ºC. This means efficient use and prevention of excessive consumption. Plus there’s an energy efficiency indicator incorporated into the product, which will display a coloured indicator according to your consumption (green for optimal, amber for exceeding normal and red for above-estimated consumption). Perfectly balanced – Our radiators ensure the surface temperature does not exceed 43ºC (once reached steady working rate). The heat is distributed evenly throughout the radiator surface with no burn risk. Plus with specially formulated biodegradable thermal oil, that provides maximum heat transfer, you can rest assured that our radiators are perfectly balanced with the lowest consumption. Multiple finishes - Available in many different finishes including white and graphite with a range of RAL colours (see colour chart). 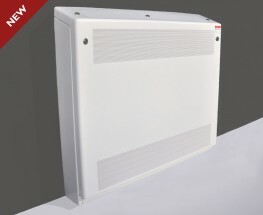 Integrated connectivity – An integrated Wi-Fi module in each D Series radiator allows you to connect an entire installation without intermediate gateways. The high power Wi-Fi modules can reach up to 100m without obstacles and our servers have a reliability of over 99%. The free Rointe Connect app – With the free Rointe Connect app your smartphone, tablet or PC will give you easy control of your installation. You can adjust temperatures, lock the products remotely and control the expenditure on a daily basis from home, your office or on the go. With the app, you can divide the property into rooms, floors or bespoke zones and can control to suit your needs. You can program activation and shutoff at whatever time you desire, maximising your energy savings. Plus the app allows you to view real-time energy consumption reports by day, month or year along with the ability to configure different kWh prices for each hour of the day. It will also send warnings, notifications and recommendations direct to your device so you can save on consumption.